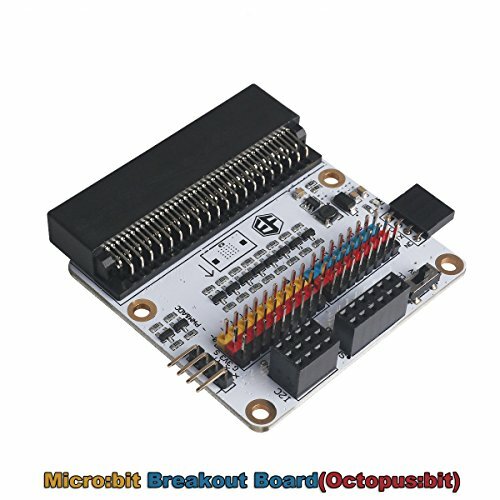 ElecFreaks Micro:bit Breakout Boardcan completely match with BBC Micro:bit pins. Plug our breakout board into BBC Micro:bit, you will find it is much more convenient to lead. We all know the side pin on BBC Micro:bit board can lead to the input signal or generate control signal with special interface. As for pins of 0/1/2/3V/GND, we can use alligator clip to lead signal. But other pins are too close to lead, which is obviously presented on micro:bit board. Usually the voltage of micro:bit is 3.3V while other modules (like LED digital tube module, IIC LCD module, etc.) connected to it require 5V power supply and 5V TTL voltage to work properly. To solve the above problems, we have invented ElecFreaks Micro:bit Breakout Board. Demonstration of BBC Micro: bit Board's basic Operations: https://youtu.be/X7miVdu9S-k; Micro:bit Breakout Board can completely match with BBC Micro:bit pins. There are pins for VCC and GND beneath each I/O port with different colors for your recognize. You can connect breakout modules conveniently. If you have any questions about this product by Flight-sky, contact us by completing and submitting the form below. If you are looking for a specif part number, please include it with your message.